Emory Healthcare and The Atlanta Legends have entered into a health care partnership that designates Emory Healthcare as the Official Team Medical Services Provider of The Atlanta Legends. The Atlanta Legends is one of eight teams in The Alliance of American Football’s new professional football spring league, which kicks off on Feb. 9, one week after Super Bowl LIII. The Atlanta Legends will play home games at the Georgia State Stadium, in downtown Atlanta. The Emory partnership provides The Atlanta Legends organization with comprehensive and seamless state-of-the-art medical care. It includes access to Emory Healthcare’s world class sports medicine, orthopaedics and spine physicians, as well as priority access for all medical needs to Emory Healthcare’s 11 hospitals, advanced imaging equipment and physicians in more than 70 medical specialties. “Everyone at Emory is very excited to play a role in helping the new Atlanta Legends organization perform at the highest level,” said Scott D. Boden, MD, director of Emory Orthopaedics & Spine Center and chairman of the Department of Orthopaedics at Emory University School of Medicine. “Today, caring for professional athletes requires seamless integration of all medical needs in addition to musculoskeletal care, and Emory is honored to be trusted with this responsibility for The Atlanta Legends,” said Jonathan Lewin, MD, president, CEO and chairman of the Board of Emory Healthcare. The partnership also provides The Atlanta Legends access to Emory Healthcare’s sports science research and performance measurement expertise at the Emory Sports Medicine Complex in Brookhaven, where the Atlanta Hawks have their training and practice space. Emory Healthcare is the official team healthcare provider for the Atlanta Falcons, Atlanta Hawks, Atlanta Braves, and the Atlanta Dream, as well as collegiate athletics programs, including Georgia Tech, Clark Atlanta University and Emory University. Emory Healthcare also provides medical care for athletic programs at more than 20 high schools in the Atlanta area. The Atlanta Legends are preparing for the season at their first training camp in San Antonio, Texas for the month of January, getting ready for their regular season debut on Feb. 9 at The Orlando Apollos. Their first home game is scheduled for Feb. 24 at Georgia State Stadium against The Birmingham Iron. Kevin Coyle is The Legends head coach and Michael Vick is the team’s offensive coordinator. Former University of Georgia star quarterback Aaron Murray was the team’s first draft pick in team history. Emory Healthcare, with more than 21,000 employees and 11 hospitals, is the most comprehensive academic health system in Georgia. Emory Healthcare has $3.3 billion in annual net revenue and provides $89.1 million in charity care. System-wide, it has 2,673 licensed patient beds, 2,800 physicians practicing in more than 70 specialties and serves metro Atlanta with 250 locations. Emory Healthcare is the only health system in Georgia with three Magnet-designated hospitals, Emory Saint Joseph's Hospital, Emory University Hospital and Emory University Orthopaedics & Spine Hospital, for nursing excellence. Emory Healthcare's core purpose: "To serve humanity by improving health through integration of education, discovery and health care." For more information, visit emoryhealthcare.org. 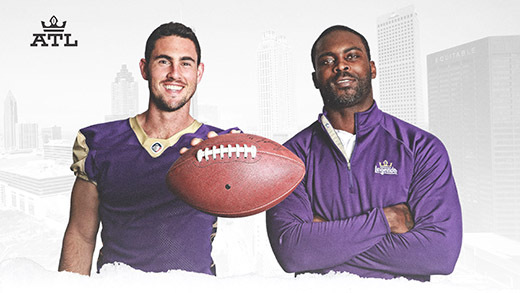 A member of The Alliance of American Football, The Atlanta Legends is led by an experienced professional front office, coaching and playing staff featuring general manager Billy Devaney, head coach Kevin Coyle and team president David Livingston. The Legends compete in The Alliance of American Football with The Birmingham Iron, Memphis Express, Orlando Apollos, Arizona Hotshots, Salt Lake Stallions, San Antonio Commanders and San Diego Fleet. The name Atlanta Legends is inspired by the larger-than-life greatness of the people who have helped create the rich sports identity and hallowed history of the city. Atlanta’s deep connection to pioneering legends throughout its influential history will be symbolized with a regal crown logo with the colors of purple, gold and white.